My body was in Florida celebrating 20 years of marriage... My heart was in China. I could think of little else. My mind was in full-out war with itself. One moment I was certain - the next - terrified!!! Doug and I knelt next to our hotel bed and begged God for direction. For Doug, the whole process was pretty cut and dried. You feel led to do something - go do it! Not me!!! I was on an emotional roller coaster. Couples celebrating their 20th wedding anniversary aren't usually contemplating starting a family--- again! Nothing could cure my restless heart like a good long walk on the beach with the Lord. I grabbed my Ipod and headed out the door. I set my Ipod on one song and hit repeat again and again for the entire walk! The words of that song expressed the words of my heart... a prayer I couldn't have spoken better myself! "I'm finding myself at a loss for words, and the funny thing is, it's OK. The last thing I need is to be heard, but to hear what you would say. Word of God speak. Would you pour down like rain? Washing my eyes to see your majesty. To be still and know that you're in this place. Please let me stay and rest in your holiness. Word of God speak!" "I'm finding myself in the midst of you, beyond the music, beyond the noise. All that I need, is to be with you, and in the quiet, hear your voice. Word of God speak. Would you pour down like rain? Washing my eyes to see your majesty. To be still and know that you're in this place. Please let me stay and rest in your holiness. Word of God speak. Would you pour down like rain? Washing my eyes to see your majesty. To be still and know that you're in this place. Please let me stay and rest in your holiness." "I'm finding myself at a loss for words, and the funny thing is, it's OK."
It was a cold, winter day, so I had the beach to myself. I raised my hands in prayer to the Lord... I cried... I begged God to come near! As I walked along, praying, I noticed a beautiful white feather near the edge of the water. I had always collected shells and shark's teeth along the ocean, but I'd never seen a feather like this one before. I picked it up and noticed it's end was shaped like the perfect quill. 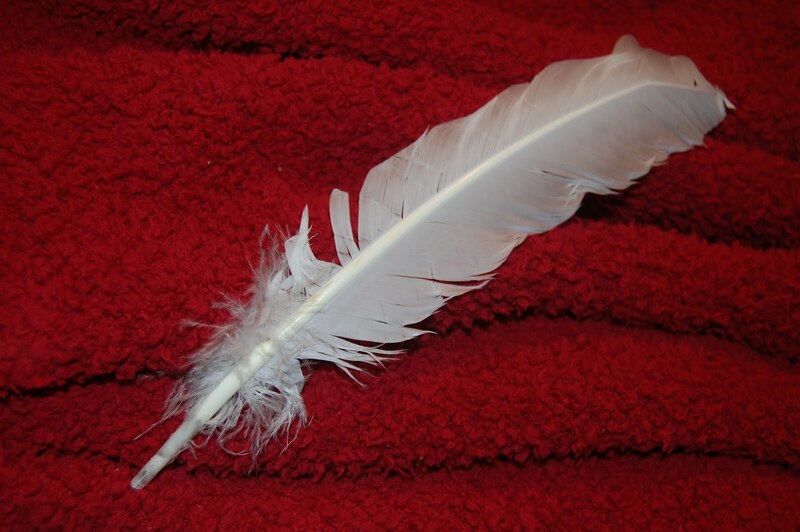 "Lord," I prayed, "take this feather and write your will on the tablet of my heart. I don't want to fight anymore... or weigh the cost... or worry about what's good for me... I simply want to obey! Help me to follow wherever that may lead!" I decided to take my beautiful feather home to remember my time with the Lord. I rinsed it and packed in in my suitcase for the flight home the next day. Later that night, while spending some time with a close friend who knew of my "dreams", she introduced me to a book entitled "The Dream Giver" by Bruce Wilkinson. I picked up a copy on our way back to the hotel and tucked it into my carry-on bag for the long flight home. We had barely taken off when I grabbed the book and started to read about a Nobody named "Ordinary" (because... well, he was ordinary). He lived in the Land of Familiar with all of the other Nobodies. Ordinary had big dreams... but Nobodies in the Land of Familiar didn't do big things! One morning, however, Ordinary discovered a long white feather resting on the sill of his window. The Dream Giver had left it there just for him and beckoned him to follow his dream! There, packed in my suitcase, was my own beautiful white feather!! !...left by my Dream Giver to bid me to follow! I sobbed like a baby that God would indeed "speak" to me in such a personal way! Before we even landed in Houston I knew that I would indeed follow my God-given dreams to China! Little did I know then, what a beautiful tapestry of redemption God had begun to weave in my life!